My husband and I are fans of good French onion soup. 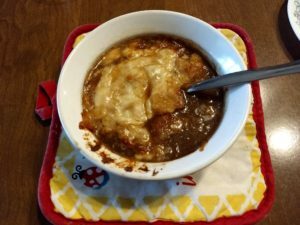 We reviewed Aldi’s Bremer Bistro French Onion Soup a couple of years ago and like to eat that on a cold winter’s day. Aldi’s soup is a Special Buy (ALDI Find) that shows up once or twice a year, and we usually buy a box or two. Then I discovered French onion soup at Trader Joe’s — available year-round — and decided to give it a try as well. 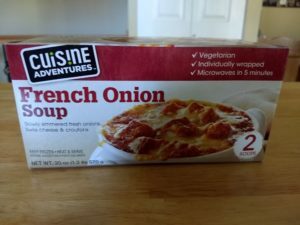 Trader Joe’s Cuisine Adventures French Onion Soup is a product of Canada and was $4.99 at the time of publication (Aldi’s soup is $3.99 for a similarly sized package). The box describes it as “slowly simmered fresh onions, Swiss cheese & croutons.” I assumed it was made with a beef broth, but it’s actually vegetarian and is made with a vegetable soup base that includes carrots, onion, and celery. Each 10-oz. serving is 201 calories, with 10 grams of total fat, 35 mg of cholesterol, 740 mg of sodium, and 4 grams of sugars. One serving also gives you 20% of your daily value of calcium. You can view a full list of ingredients and nutrition information at this link. Similar to Aldi’s French onion soup, Trader Joe’s French onion soup is found in the store’s freezer section. Also similar to Aldi’s soup, this soup comes in a box with two frozen, individually plastic-wrapped servings of soup. They’re like large soup ice cubes. You have three ways to prepare the Trader Joe’s soup: conventional oven, microwave oven, or “quicker oven method.” Regardless of what method you use, make sure you remove all packaging before heating the soup. One serving of soup after it baked in the oven. To prepare in a conventional oven, preheat the oven to 400 degrees. Place each soup block in its own oven-proof bowl (300 ml bowl capacity; I used two CorningWare bowls), with the cheese side up. Heat for 40 minutes or until the cheese is golden brown. To prepare in a microwave, place one soup block, cheese on top, in a microwave-safe bowl. Heat on high for 3 minutes. Stir and heat for 2 more minutes. To prepare using the “quicker oven method,” preheat the oven to 400 degrees. Place each soup, cheese side up, in its own bowl that is safe for both microwave and oven. Heat each soup on high for 3 minutes in the microwave. Remove the soup from the microwave, and then sprinkle on top about 2 tablespoons of additional shredded Swiss or other firm cheese. Heat in a preheated oven for 20 minutes or until the cheese is golden brown. We prepared our soup using the traditional oven method. While the soup was hot enough that it was fine to eat, I recommend heating it for a few more minutes than what the directions instruct; perhaps baking for 45 minutes instead of 40. I heated our soup for the recommended 40 minutes in the oven, but after a few bites, I ended up popping my serving into the microwave for another 30 seconds to 1 minute. My husband and I liked this soup. It tastes pretty similar to Aldi’s French onion soup, with a nice ratio of broth to onions and a generous amount of melted, crusted cheese on top. I think Trader Joe’s soup has a few more croutons than Aldi’s soup, but otherwise there are few differences. Trader Joe’s Cuisine Adventures French Onion Soup is an easy alternative to making French onion soup from scratch. It’s about a dollar more than Aldi’s Bremer Bistro French Onion Soup, but it’s also available all the time, where Aldi’s version is not. The two stores’ soups taste similar, but the Trader Joe’s version seems to be a bit more generous with the croutons, so you can decide what’s more important to you. Bremer Bistro, Cuisine Adventures (Trader Joe's). Bookmark.